Hartford Chorale, in association with ACFEA, is excited to offer a musical tour to three cities in the UK – Stratford-Upon-Avon, York, and Edinburgh – July 17-27, 2020. Your tour includes three nights in each of these locations (9 nights total), guided tours of each city, and the opportunity to perform in some of the most beautiful churches in each city. (Plus much more!) Our musical experience is led by our Music Director Richard Coffey. Family members and guests are encouraged to come along. Nonmember singers are welcome to audition to join this tour. The estimated cost for the tour is $3900 per person (dbl occupancy). For more information regarding this tour, please download the tour brochure or email tour@hartfordchorale.org Additional tour documents provided below. While our primary audience is the Greater Hartford area, the Chorale has performed three times at Carnegie Hall in New York City; in Providence, Rhode Island; in Worcester, Massachusetts; and in Middletown, New Britain, Storrs, Fairfield, and New Haven, Connecticut. In 2017, 63 participants traveled to Europe for a musical tour in Czech Republic, Austria, and Hungary. 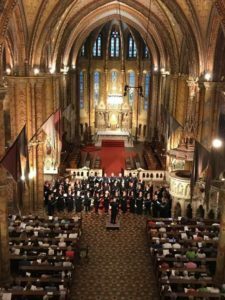 The “Jewels of Europe” singers performed to standing-room only audiences in the historic St. Salvator’s Church or Church of the Holy Savior in Prague, the splendid Stephansdom in Vienna, and the 14th century Matthias Church in Budapest. In 2014, the Chorale completed a performance tour of Paris with concerts in the beautiful American Church in Paris, the Church of St. Etienne-du-Mont (musical home of Maurice Durufle), and, in a journey to the countryside, a concert in glorious Chartres Cathedral. More than one hundred travelers enjoyed this magical experience. It was a great honor to be specifically invited back to sing at the Cultural Olympiad in China! In collaboration with the New York Choral Society, we traveled to China in June 2008, to sing in the Opening Ceremony of the Olympic Cultural Festival in Beijing, another concert in the Beijing Concert Hall, and a third concert in Qingdao, in the Qingdao People’s Hall. In 2001, sixty members of the Chorale toured China in collaboration with the New York Choral Society following an invitation from the Office of the Ministry of Culture of the People’s Republic of China. The combined chorus of 150 singers performed a concert of American music, including Bernstein’s Chichester Psalms, at the New Century Theater in Beijing, then traveled to Shanghai to perform Verdi’s Requiem at the spectacular Grand Theater. The following evening the group appeared in the beloved Beethoven’s Ninth Symphony, led by the distinguished Chinese conductor Mr. Hu Yong-Yan. In 1999, The Chorale also embarked on a twelve-day European tour, with performances in Vienna, Salzburg, and Venice. In 1997, we were invited to participate in the “Voices in the City” festival in Birmingham, England, and also performed in Ireland and Wales.